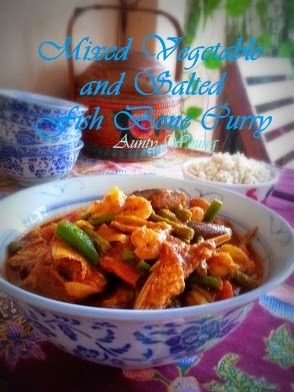 When we were living in Penang, this Mixed Vegetable and Salted Fish Bone Curry was a frequent dish. Sometimes it came as a choice from economic rice stall, sometimes it came as a homemade dish from neighbors, but never once from our own kitchen. 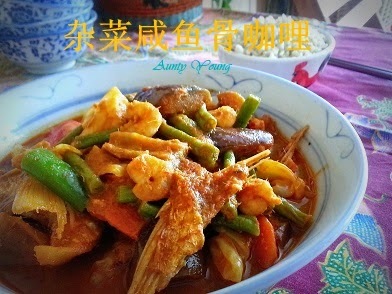 These past five or six years, it's not that we didn't miss this aromatic dish, but I simply never bought Salted Fish Bone. As for why, even I myself can't answer. The other day, my wonderful neighbor gave me a packet of Salted Fish Bone. 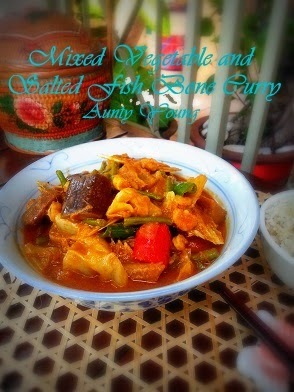 Obviously, the only thing to do with it was to cook this long-missed Mixed Vegetable and Salted Fish Bone Curry! 1. 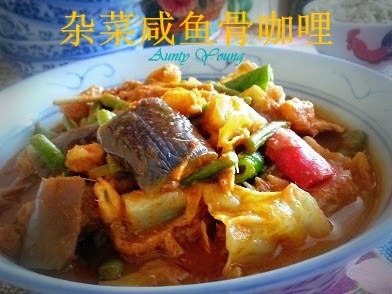 Heat up oil and pan-fry salted fish bone until fragrant. Dish and drain. 2. In the remaining oil, saute A until fragrant. Add in B and continue to stir-fry until aromatic. Pour in water and bring to boil. 3. Add in fried salted fish bone, C and bring to boil. Lower the heat and simmer until the mixed vegetables are soft. 4. Add in seasoning and thick coconut milk and bring to boil. Lastly add in prawns and bring to a quick boil. 5. Taste. Dish up and serve hot with rice. How I wish I am invited to to enjoy this simple homey dish. What can I cay more.....my favourite! my dear, you are always welcome. Moreover when we talk about enjoying food,it is always the more the merrier . 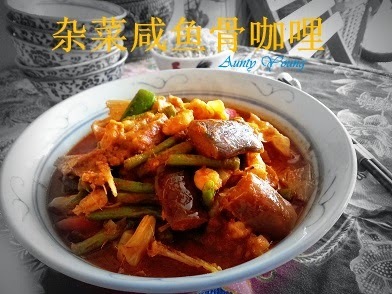 Hahaha Aunty Young, you have here one of my favourite Kiam Hu Kut Gulai. One curry that I will never say No. In the past, I used to add cockles to this curry but not anymore now cos' I don't know if they are contaminated. Without it the curry is just as good. I would like to try your recipe. Is it very spicy? I also worry about the infection of Hepatitis due to cockles contamination, therefore I used prawns instead. No,it isn't too spicy.it is just nice to inspire the appetite . 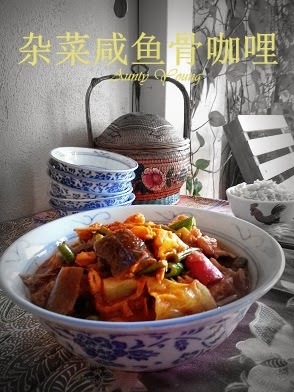 Hi Aunty Young, I read the name also I know this dish is very yummy already. Extra rice please! Here is another bowl of rice for you, Yen! ha.....ha......so happy having this yummy curry with you.